July, unsurprisingly, starts as June ended – with the brightest of the planets, Jupiter and Venus, still in conjunction (close to each other) low in the glow of the sunset. This month, though, Venus stops its defiance of the gradual westward movement of the rest of the sky and starts to follow Jupiter towards the western horizon. They should both be visible for most of the month but you’ll have be quick to spot them as soon as the sky starts to darken. Look for a thin crescent Moon close by on the 18th and 19th. Watch as the Moon creeps along the ecliptic, day by day, to approach that other bright planet, Saturn. This most intriguing of celestial objects can be seen to be sitting in amongst the more difficult-to-see constellations of the Zodiac. To the right is Virgo with the bright star Spica clearly visible. Then follows Libra, with its brightest star, Zuben Elgenubi, which I always think sounds like a character from Star Wars. 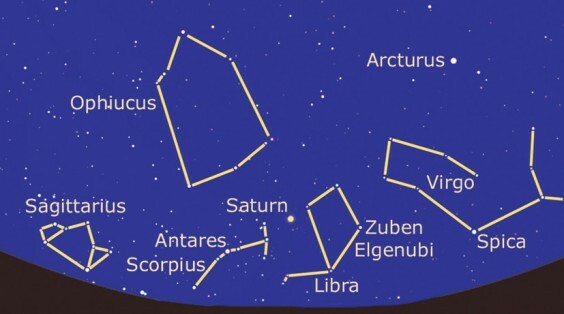 Then we have Saturn, followed by Scorpius which contains the brightest star in this area. This is Antares, which never rises very high in our skies and is only visible for the three months of summer. It also has science-fiction connections, having been the home star of one or two alien races. Then come Ophiucus and Sagittarius. Whoa! What? When did Ophiucus creep into the Zodiac? Actually, it’s always been there – well, since the International Astronomical Union decided that the Sun spends the fist two weeks of December in it. It is quite a large constellation, sort of house-shaped, sitting mostly above the ecliptic. Two indistinct arms grow up from its base, the right-hand one of which is called Serpens Caput, which presumably means “Dead Snake”? Its partner on the left side is Serpens Cauda and explains why Ophiucus is referred to as the “Serpent Bearer”. This is the best time of year to see this little-known constellation, although you may have to wait till it is really dark (long after closing time) and before the Moon gets close to being full on the 31st. This is also true for Sagittarius, which for some reason is known as “the Teapot” by astronomers. The 30th sees the peak of a rather splendid meteor shower known as the Delta Aquariids. Unfortunately, the full Moon being the following night, the sky will be too bright to see the less spectacular ones. However, this time of year sees lots of people sitting outside till after dark so it is always worth keeping an eye open for those rapid, bright flashes of light overhead. In fact, if you’re up long enough, you get a chance to see those harbingers of winter rising before the Sun erases them. Over the north-eastern horizon, from about two in the morning, can be seen firstly the Pleiades, followed by Taurus with its great red eye that is Aldebaran.